Welcome your guests - or just treat yourself like one - with lofty, luxurious bedding. Crisp cotton and soft down fill turn any nights sleep into a five-star experience. Love this comforter. Too nice to be called just that. Looks and feels rich. Took my breath h away seriously. This isn't my first down comforter by a long shot. I've owned two prior to this. But I will say its the best one yet. Once I took it out of the plastic and let it breath, I was impressed. I have yet to put it in a duvet because I wanted to see if it leaked feathers, it doesn't. The $400 price tag made me think twice, I didn't want to spend such a large amount, but it's well worth it.If you've been thinking of getting this comforter, do it! No Regrets. 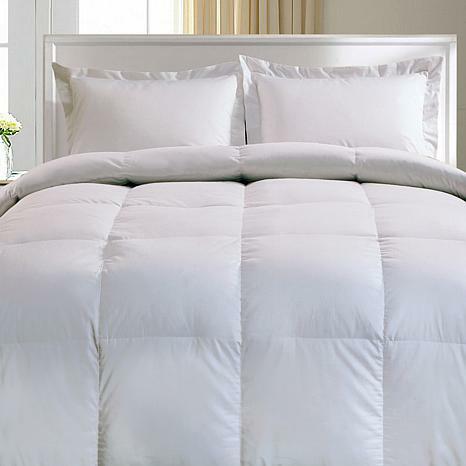 This is a wonderful soft comfortable comforter! I would highly recommend! A bit pricey, but just remember, you GET what you pay for, love love it! This Comforter truly is everything and more than I was expecting. It is larger and more elegant and perfect on those cold wintry nights. Very soft and heavy. I love it..i just wish it was more plump.